The world's most impressive passing team, Spain, face an explosive Netherlands attack in a highly anticipated World Cup final on Sunday with the only certainty being a new, first-time, world champion. Despite their great traditions, generations of top players and leading clubs, neither the Dutch nor the Spanish have ever had their hands on the game's top prize. European champions Spain have never previously gone beyond the quarter-final stage while the Dutch emerged from their glory years in the 1970s having lost in two successive World Cup finals in 1974 and 1978. Spain's mesmerising passing game this time was too much in the semi-finals for a Germany team that had impressed so many with their crushing wins over England and Argentina but succumbed to a 1-0 defeat. The Netherlands showed their power in the final third in their 3-2 semi-final victory over Uruguay with the impressive Wesley Sneijder and Arjen Robben scoring after arguably the goal of the tournament from captain Giovanni van Bronckhorst. But Dutch coach Bert van Marwijk is well aware of the quality of opposition his team now faces. 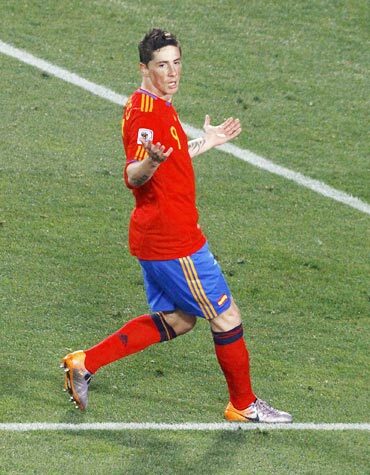 "Spain were the better team against Germany and really deserved to win. They are the best team in the world at this moment," he said. The Dutch head into the final with a remarkable run of wins -- they have won now 14 competitive matches in a row, including all their World Cup qualifying matches, yet they can hardly be considered favourites against a Spanish team which has lost just twice in their last 53 matches. "It doesn't interest me who is favourite for the final, I just don't care what the whole world is saying," said van Marwijk. "We will just go out and play our own game -- we see it as a great challenge to play them," he said. Incredibly given their pedigree, it will be the first competitive meeting between both countries since November 16 1983, when they played in a European Championship qualifier in Rotterdam, the Dutch coming out top 2-1 thanks to a winner from Ruud Gullit. The Dutch squad is completely fit and even Gregory van der Wiel and Nigel de Jong, who both were suspended for the semi-final against Uruguay, are available again. Spain's success has come despite the lack of form of their leading striker Fernando Torres but David Villa's five goals have made up for the Liverpool forward's problems and dangerous winger Andres Iniesta is hitting his stride at just the right time. Spain lost their opening game of the tournament to Switzerland but have gradually eased through the gears to find their best form for when it really matters. Although Spain's brand of quick, short passes and retention of possession does not make for wide open games, it lends itself to fascinating tactical battles and -- as Germany found to their cost -- the counter-attacking approach is hard to apply. The Dutch also like to break with speed and numbers but they may well have to engage in more of a midfield chess game if they are to avoid the fate of the Germans. "We will try not to let the win over Germany blind us to the task in hand. We'll focus on the job we have to do because we want more," said Spain coach Vicente del Bosque. "Holland is a country with a great football tradition and these are two teams who are so keen to be world champions for the first time," he added. Brazil have won the World Cup a record five times, Italy have been crowned on four occasions and Germany have three victories. Argentina and Uruguay have won the tournament twice and England and France have each won once. Sunday's game will also mark the first time that a European team has won a tournament held outside of their own continent.